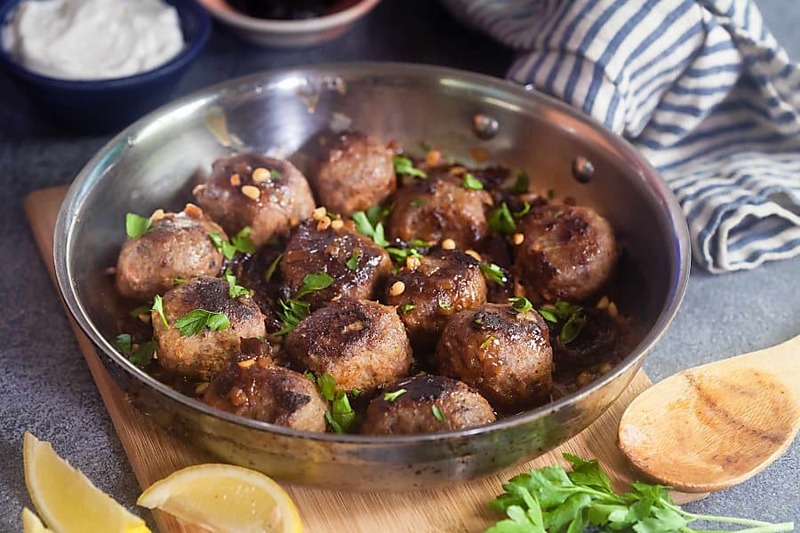 These meatballs, served with a rich prune and pine nut gravy, were inspired by the flavors of North Africa. Serve them over orzo, rice, or couscous for an extra special weeknight dinner. I created this recipe for my client, California Prunes, through Kitchen PLAY. When was the last time you had a prune? Can you remember? I go through phases with them – I’ll either eat them like they’re going out of style or I’ll completely forget that they even exist. Which is a shame, because they’re really good! I remember going to brunch one time when I was really little – maybe 6 or 7 – and basically throwing a temper tantrum because I wanted prune juice with my blintzes. I was a real joy as a child. I’ll admit that I’ve been in the forgetting prunes exist phase for a while, but when the opportunity to work with California prunes arose I was like “oh yeah, I like those!” and now I’m back to eating them like it’s my job. Which, in a weird way, it is. Prunes are a natural fit for baked goods – they’re an awesome addition to oatmeal cookies and are delicious paired with chocolate – but they’re also great in savory recipes. 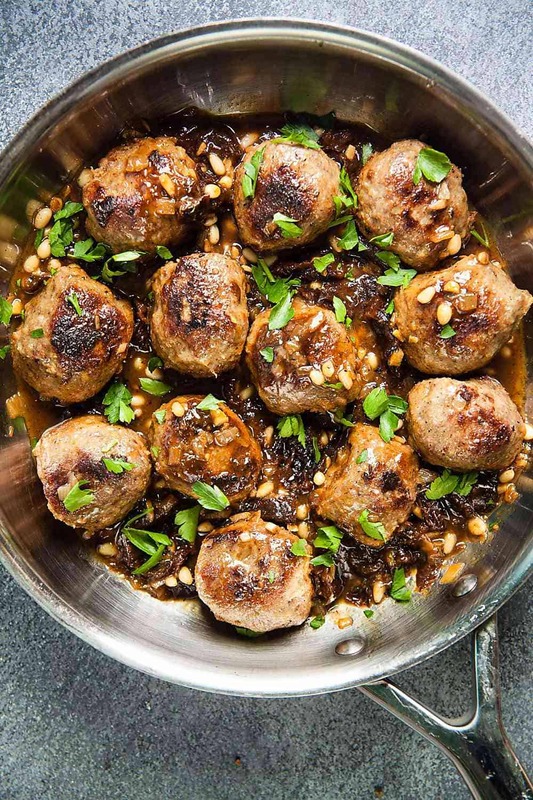 In this meatball recipe, the prunes cook down and help thicken the gravy and add a subtle sweetness that balances out the more savory elements. I also added wine and lemon juice to keep the flavor of the dish bright and stirred in a smattering of pine nuts for texture. It’s so flavorful that you won’t believe it comes together in just 20 minutes! 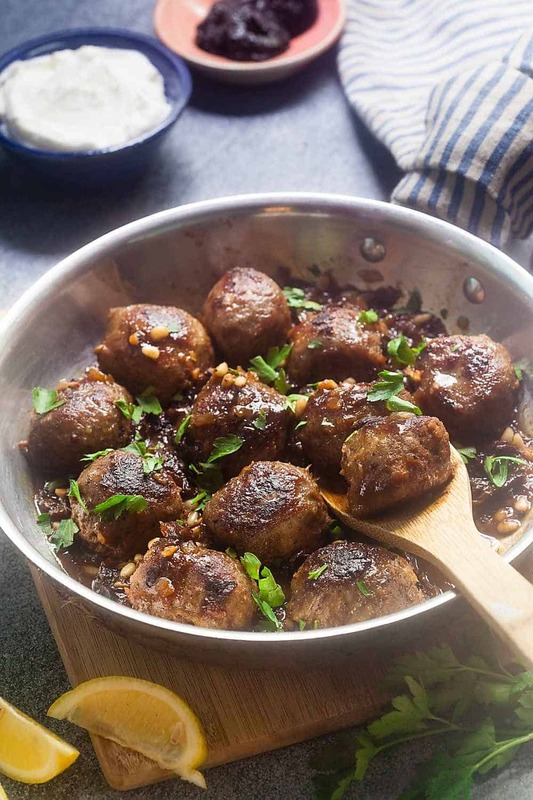 For maximum flavor, I used a combination of beef and pork for these meatballs. You can do the same or use your favorite meatball recipe. 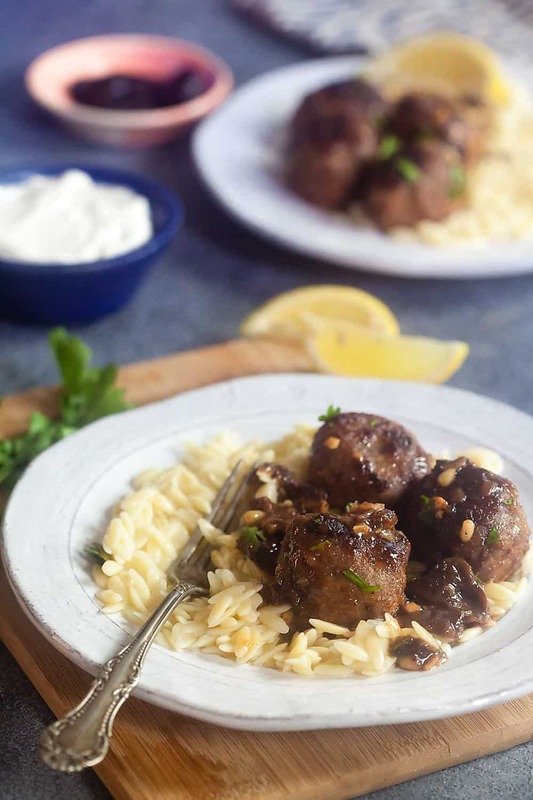 In a pinch, you can even use premade meatballs from the butcher case for a super easy weeknight meal – when it comes down to it, this recipe is all about that delicious gravy. 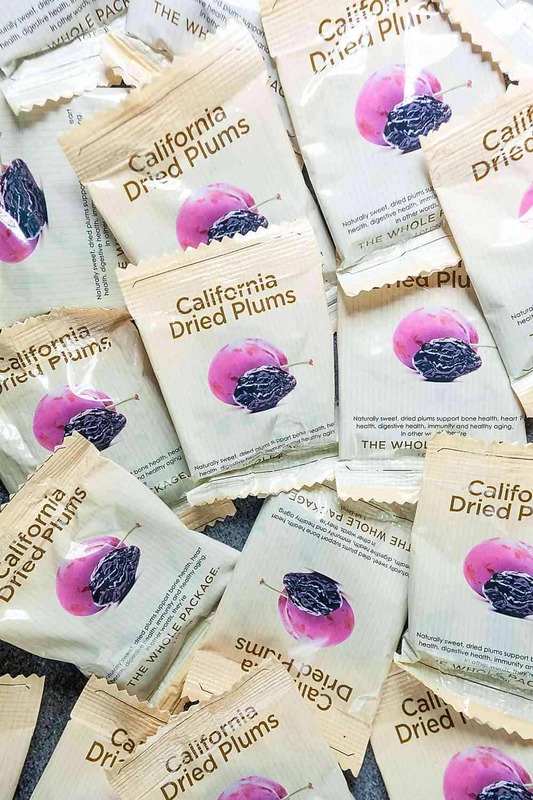 Did you know that some of the highest quality prunes in the world come from California? There are 800 prune growers and 29 prune packers that have perfected growing and harvesting techniques that help make California prunes recognized worldwide. 45,000 high production acres, concentrated in the Sacramento and San Joaquin valleys, produce almost all of the U.S. supply of prunes. In addition to being tasty, prunes also have some great health benefits. A single 100 calorie serving has 3 grams of fiber and no fat, sodium, or cholesterol. They also contain polyphenols, which act as antioxidants in the diet. The fiber is great for digestive health and also for making you feel full – they make a great mid-afternoon snack that keeps me satisfied until dinnertime. Combine the beef, pork, egg, breadcrumbs, 1 clove garlic, 1/2 the onion, and Italian seasoning in a large bowl. Use your hands to mix everything together, taking care not to overwork the meat. Divide into 12 rounds. Heat the oil in a large skillet over medium-high heat. Add the meatballs and cook for 3 minutes on each side, or until browned. Transfer to a plate. Add the remaining onion and garlic to the skillet and cook 2-3 minutes, or until softened. Stir in the wine, if using, and cook until nearly all evaporated, scraping up any browned bits from the bottom of the pan. Whisk in the chicken broth and lemon juice. Add the meatballs and prunes and bring to a simmer. Cook 20 minutes, or until the meatballs are cooked through and the sauce is reduced. Season to taste with salt and pepper. Stir in the pine nuts and sprinkle with parsley. If desired, serve with yogurt and lemon wedges. If you prefer, you can use 1 pound of beef instead of half beef and half pork. For a gluten-free version, use gluten-free bread crumbs and serve over rice. These look delicious! I imagine these would be tasty over salad or made into a sandwich! Wow – these are incredible!! Great use of prunes! Love these interesting flavors. Yummy comfort food! These look and sound incredible – pinning!